The designated hitter wants to retire with the Red Sox, with whom he’s won three World Series titles. FORT MYERS, Fla. (AP) — David Ortiz hopes to get a one-year contract extension “pretty soon” and Boston Red Sox owner John Henry would like to fulfill his designated hitter’s desire to retire as a member of the team. Whether a new deal will be completed during spring training remains uncertain. AP photo WANTING TO STAY: Boston Red Sox designated hitter David Ortiz takes batting practice during spring training Tuesday in Fort Myers, Fla. Ortiz wants a one-year contract extension and to retire with the Red Sox. “I think it’s going to be OK,” Ortiz said Wednesday. “Conversations are good. My bosses are more than happy to talk about what we’re talking about. They’re trying to get this out of the way so it doesn’t begin to be a distraction. About 90 minutes later, Henry was more restrained when asked if he expects a speedy resolution. Henry said he and other Red Sox owners would be in town by Thursday. Fernando Cuza, Ortiz’s agent, has been in Fort Myers this week. 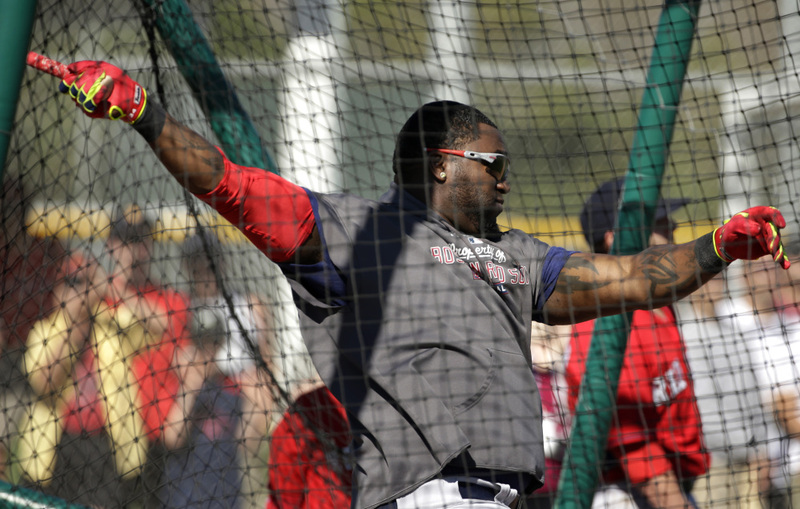 Ortiz, 38, is in the final year of a $26 million, two-year contract as he enters his 12th season with the Red Sox. He began last spring training with a heel injury that hobbled him early in the season. But he finished with a .309 batting average, 30 homers and 103 RBIs. In the six-game World Series victory over the St. Louis Cardinals, he batted .688 and was the MVP. The Red Sox could be wary of Ortiz having problems with his health or production at his age. But he’s looking forward to another outstanding season. In 11 seasons with the Red Sox, Ortiz is batting .292 with 373 homers and 1,191 RBIs. That averages out to 34 homers and 108 RBIs per season. He’s more upset with people who criticize him, citing “haters” who “talk trash” on radio — than he is with the Red Sox. He said he doesn’t bring up his desire for an extension, but responds to questions asked by reporters. And one of those questions is how long he’ll continue playing. Ortiz’s desire for a one-year extension “is certainly something we should listen to and consider,” Henry said. Can Ortiz imagine playing for another team? After slumping in the AL championship series against the Detroit Tigers, Ortiz went 11 for 16 with two homers and six RBIs in the World Series. His .688 batting average and .760 on-base percentage were the second highest in Series history. “People sometimes want to make a big deal about a guy like me asking for another year extension when some others are asking for a 10-year extension,” he said. “If it doesn’t get done, it doesn’t get done. I’ve got to come in and get my job done like I normally do.